I'm big fan of vegetarian pasta dishes. Especially if they make liberal use of breadcrumbs (here, have some carbs with your carbs!) 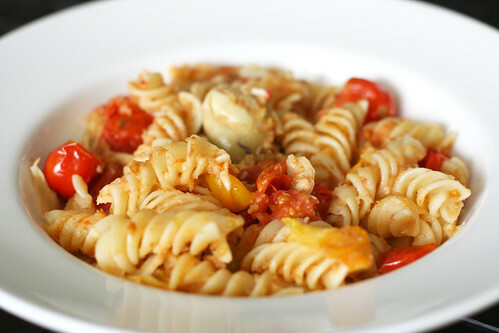 I've made a lot of easy vegetarian pasta recipes, and this is definitely one of my favorites. My take on a classic from Giada De Laurentiis, it isn't the quickest weeknight meal (I'd say it takes about 45 minutes from start to finish, including non-active roasting time), but it's really simple to put together. The red and yellow tomatoes are the prime flavor source here; artichoke hearts and bread crumbs are supporting actors. The technique of roasting the veggies under breadcrumbs and then tossing them with the pasta was new to me. I'm excited to try it out with different veggies. If you're looking for simple, fresh flavors, Pasta Ponza is an excellent choice. For what it's worth, I found that the leftovers the following day were even tastier. 1. Place an oven rack in the center of the oven. Preheat the oven to 375 degrees F. Butter an 8 by 8-inch glass baking dish. 2. Place the tomatoes, artichoke hearts, 1 tablespoon olive oil, 1/2 teaspoon salt, and 1/4 teaspoon pepper in the prepared baking dish. Toss to coat. Sprinkle the breadcrumbs over the tomato mixture. Drizzle the top with olive oil and bake for 30 to 35 minutes until the top is golden. Cool for 5 minutes. 3. Bring a large pot of salted water to a boil over high heat. Add the pasta and cook until tender but still firm to the bite, stirring occasionally, about 8 to 10 minutes. Drain and reserve about 1 cup of the pasta water. 4. Place the pasta in a large serving bowl. Spoon the tomato mixture onto the pasta. Add the cheese and toss well. Thin out the sauce with a little pasta water, if needed. Season with salt and pepper, to taste. Sprinkle with the chopped parsley (if using) and serve immediately.